For Valentine's day, and beyond, nothing says love like juicy steaks. If your Valentine likes beef, then these juicy steaks with amazing vermouth mushrooms are sure to be a huge hit. 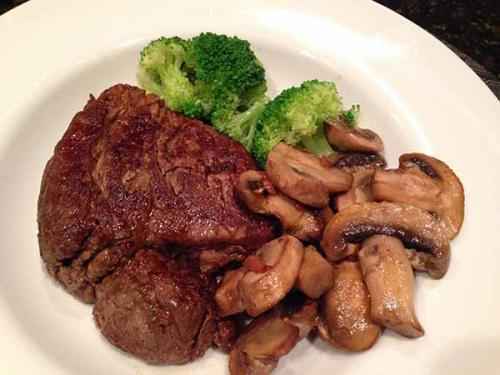 Juicy filet mignon and vermouth mushrooms make a great Valentine's Day treat. Heat the ½ stick butter and the vegetable oil in a cast iron skillet to a high temperature. Add shallot and thyme to the skillet, and cook, stirring until the shallot is browned, about 30 seconds. Add vermouth and let simmer until almost reduced by one half. Stir the cornstarch into the broth and add to the skillet. Bring to a simmer and stir until slightly thickened and reduced to about ½ cup. Add scallion whites, mushrooms and salt, and cook, stirring occasionally until the mushrooms are browning and the juices evaporate, 6 to 8 minutes. Stir in scallion greens and tarragon and remove from the heat. This recipe comes to us from Kimberly Dungan. This is using an 8x8 casserole dish: Just add the appropriate amounts to all the ingredients to make a larger dish. Fill your casserole dish with potatoes (line them up to fill it so you know how many to use). Peel and boil the potatoes (cutting them into small chunks will allow faster cooking). Drain the potatoes and put them onto a cookie sheet Bake for ten minutes (not any more &SHY; they will get a hard crust otherwise) in a 375 degree oven. After taking them out of the oven, put into a large mixing bowl, set aside. Chop ½ onion and 3 slices of Fat Free Jennie-O Turkey bacon (or regular bacon) into small pieces. Sprinkle garlic (to taste &SHY; about 1 tbsp), 2 tbsp. of cumin over onion and bacon and sauté for 1-2 minutes on high in a tbsp. of olive oil. Remove from heat and add 1-2 tbsp. of butter to melt over top. Mash the potatoes with ¼-½ cup of plain rice milk and 3 slices of Veggie Slices pepper jack cheese. Add 2 tbsp. Dijon Mustard Add the onion mixture. Mash together Put into casserole dish and bake for 30 minutes (same 375F degree oven). If you make a double recipe or have extra, add egg to mixture, make into patties and fry in olive oil until crisp edges for breakfast! Options: Use ¼ cup cream instead of rice milk and cheese Use Anaheim roasted peppers and Chipotle peppers (a smoky mix of sauce and peppers) instead of bacon (this is quite hot) Or, use squash instead of peppers. Also, could make with skin-on potatoes. This recipe comes to us from Cecilia McNeil. Pour over potatoes and chops and bake at 350F for 1 hour. Fantastic! Serves 6, with meat left over for additional meals. This recipe comes to us from Beth Jacobs. Mix 2 packages of Lipton Cup O Soup, Chicken Flavor (gluten-free when posted) together with ½ teaspoon Xanthan gum and Stir well. Heat ½ cup water and ¾ cup milk to boiling and add soup mix. Stir well and cool. Drain 3 cans green beans or equivalent amount of fresh or frozen beans , drain 2 cans mushrooms and sauté lightly in a pan. Add the soup mix to the beans and mushrooms. Top with crushed potato chips or toasted almonds. Cover and heat until bubbly.